Much idle talks appear these days as a part of verbal counter measures of West countries against Russian advance in Ukraine. The most attractive of all ideas is crushing Russia by lowering the prices of oil, gas and natural resources. Some analysts even remind the experience of Ronald Reagan’s policy to press USSR by dumping the oil price to $9 per barrel. But it is neither a Reagan time, nor exists any candidate of becoming Reagan-2. In fact the politician that is most close to Reagan now is… Vladimir Putin. The first real politics question is how you can lower the prices of natural resources, while at the same time you are printing money as a mad-man and are flooding all possible markets with hot and cheap cash? How exactly the price of oil will go down in a situation of money supply accelerating much faster than the oil production? In contrast with money production, producing real assets and goods – like oil, cannot be developed so fast. So even with the new extraction technologies, it is simply impossible to outrun the heroism of FED in dollars-bonanza. And it is not only about oil, gas and resources. Many other markets are also affected, even Wall Street and American government bonds depend on the hot money. At the moment there is a hidden inflation. For stopping the money flow of leading to an explosion of consumer prices, now the efforts are to direct the pressure in isolated super-bubbles planned to absorb the over-money. So such bubbles are resource prices and also – stock exchange. So if the idea is to crush the oil-price, the same flow of dollars must be redirected in any other area. But does someone know which this area is? 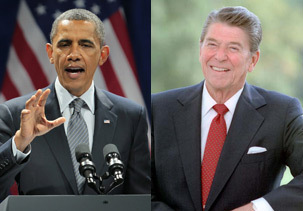 In fact, in order to implement a Reagan strategy, Obama will have first to put under control its own government finances. I.e. he will have to balance the Federal budget, along with highly deficited state and city budgets. This means deep spending cuts, and for sure – an end for Obamacare. In addition the same will have to be done in US allies that are also deeply indebted and dependent on increasing money print. So, in short – in order to be able to press Russia economically, the West will need first to implement the brutal reforms that it rejects to start for years up to now. Otherwise any attempt to lower the money-print will hit first the West itself – by making the government debt exploding due to increasing interest rates. But let’s hypothetically suppose the West can implement a Reagan strategy of lowering the price of crude oil. What will follow of this? The things that follow will make Russia and Crimea the most unimportant problem among other problems. First – Russia is not dependent only on oil prices. It has many other exports – metals, wood, gold, even diamonds. So Russia will have some mechanisms to softening the hit. Russia is very resource-rich country and is very adaptable with population ready to bear austerity in the name of greatness of “Mother Russia”. Second – many of US allies will be also hit by such a policy. UK, Norway and Netherlands are highly dependent on oil prices. In fact the North Sea extraction is much more expensive so it will be among the first oil-businesses to be closed in a case of price crash. Third – in Middle East will explode a chain reaction of instability. The main US allies like Saudi Arabia and Qatar are dependent on oil prices. A crisis in this cash-flow will destabilize these governments and may even help islamists. Relatively neutral countries like Libya and Iraq will lose stability. A new Arab Spring may throw the region in a new civil war and almost sure – in anti-Israel policy. So will USA think about Ukraine if Middle East explodes? In fact USA has no real allies in the hypothetic mission to crush the energy prices. Reagan’s plan was helped by Saudi Arabia. But now Saudi Arabia will have to be crazy to cooperate. In fact it, along with OPEC cartel, will oppose. And there is no power in the world that can overcome an alliance (even not official) of OPEC and Russia. The price of oil will not only not go down, but could even go up. USA has no real instrument to open a market war with Russia. May be the only possible is some kind of financial manipulation by selling large quantities of “paper oil”. American banks can do this in a way it was done with the price of gold. But this manipulation led only to about 30-35% decline in the price. And it was temporary. Now the gold is recovering. A 35% decrease in oil price will not bring Russia to bankruptcy. And obviously angry of such a step will be some American allies. So they will oppose, i.e. the manipulation will be a very short one. So any hopes and illusions of oil-wars to crush Putin, and any parallels with Reagan, are suitable only for fiction authors.